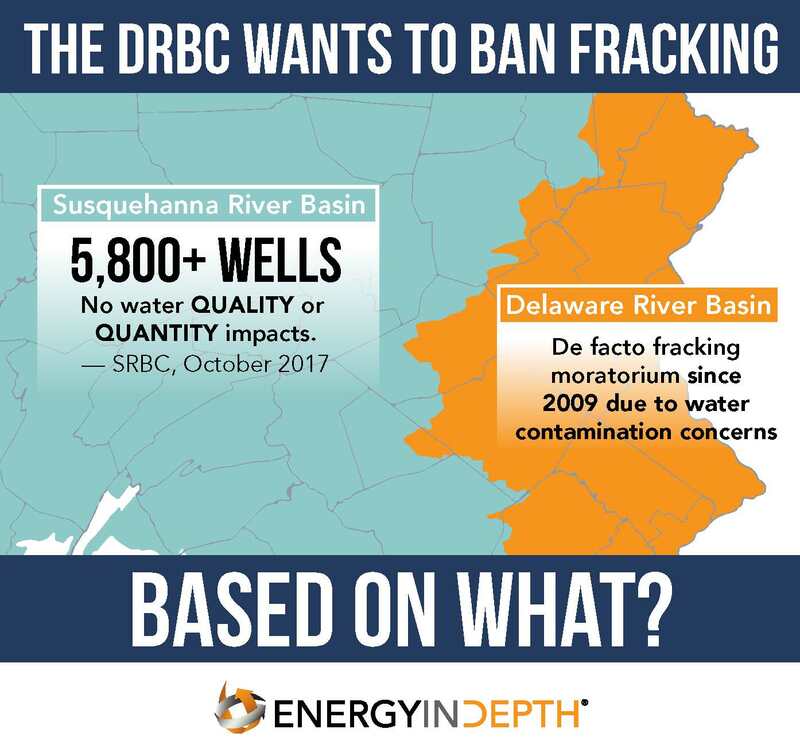 Blayne Diacont, a hydrogeologist who formally worked for the Susquehanna River Basin Commission (SRBC), recently testified before the Delaware River Basin Commission (DRBC) on its proposed ban on high volume hydraulic fracturing. My name is Blayne Diacont. I grew up in the Lehigh Valley, studied geology in college, and worked as a hydrogeologist in private consulting firms for over 10 years; delineating and cleaning up groundwater contaminations, and developing and protecting high capacity drinking water supplies for municipalities, etc. I then worked at the SRBC for six years where I co-authored the Aquifer Testing guidance document and managed surface water withdrawals when the natural gas industry first started operating in Pennsylvania. For the last seven and a half years I have worked as a Water Resource Manager for an operator in the natural gas industry. I believe in the science of what we do in my industry – that we have the ability to successfully produce clean burning natural gas while also being great stewards of the environment. At my company, in my division, we sourced all of the water for the last five years from the West branch of the Susquehanna River, we recycled 100 percent of our produced water and drastically reduced our fresh water demand by utilizing recycled produced water as more than 60 percent of our total water demand. The document produced by the DRBC (18 CFR Parts 401 and 440) states a lot of concerns regarding water demand and usage. I am in a unique position to state that I strongly believe that these concerns are grossly overemphasized, misrepresented, and that each one of them can be addressed through appropriate regulation. You only need to look at your adjacent basin and sister agency for guidance in this regard. Their existing regulations could easily be adopted as the rule in your basin. Utilizing low flow protection policies, determining what order streams have sufficient flow to support withdrawals, conditioning approvals to limit rates, performing cumulative impact analysis, installing monitoring networks and performing ARS studies could all be done at your agency, as they have done successfully at the SRBC. The utilization of their 2016 SRBC Assessment report as a footnote to your document banning hydraulic fracturing in your basin is troubling at best, as it obviously ignores statements within the SRBC document such as this: “To date, the Commission monitoring programs have not detected discernable impacts to the quality of the Basin’s water resources as a result of natural gas development.” The use of this document as a footnote, which if read clearly indicates that the industry can be successfully regulated, is an indication of either a lack of understanding of the regulatory tools available and used by the SRBC and other agencies, or a lack of effort to coordinate and understand how numerous regulatory agencies have successfully regulated our industry. 1) I would like to question on the record the DRBC’s statement that 70 percent of their watershed is underlain by the Marcellus and Utica. This is a gross misrepresentation when considering what part of the basin is actually underlain by developable natural gas. Briefly looking at a map the other night, I would approximate that it is much more likely to be less than 10 percent of your watershed. I will be developing a more closely estimated determination for written comment on this point. 2) Your report attempts to equate the fact that our industry continues to achieve longer laterals for our horizontal wells to something negative (longer laterals equals more water required to complete the well)…in the context of your report it implies that this is a bad thing. Instead, longer laterals should be seen as a positive technological advancement, because, longer laterals equals less land disturbance (less well pads required, less roads, etc.) The fact that more water is needed to complete the well is irrelevant as long as the withdrawal is properly regulated/managed/ and performed to avoid impacts at the source. The well pad is disconnected from the source… so all that matters is how, where, when, for how long, etc., is the withdrawal performed, as this is the point of potential impact. So as long as the withdrawal is regulated and performed correctly, how long it takes to store up and use the fresh water needed becomes irrelevant, and the actual CU only becomes a stat for comparison vs. other water users. Which in the case of the natural gas industry, you’d be very surprised as to how we compare with other users in your basin. This could similarly be stated of New York Department of Environmental Conservation’s (NYDEC) proposal to cap water used for completing a well at 300,000 gallons, which it seems the DRBC considered adopting. Arbitrarily limiting the allowable volume to complete a well could in fact have unintentional negative consequences. Although it would likely make gas extraction uneconomically viable if implemented (possibly the goal of the proposing agencies)…if wells could be drilled, it would require exponentially greater number of wells to harvest the gas.